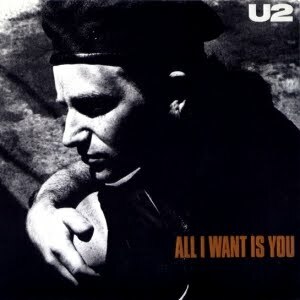 "All I Want Is You" song lyrics by U2 from Rattle and Hum. A classic track from the U2 album that a lot of people disliked following the massive popularity of The Joshua Tree. The video of the song is almost as famous as the song itself. It tells the tragic story of a dwarf (played by Paolo Risi) who falls in love with a trapeze artist (played by Paola Rinaldi), one of whom apparently dies towards the end. While there is disagreement amongst fans about exactly who has died and what that means, The Edge was quoted as saying it is the trapeze artist who dies. Check out Angel of Harlem, an ode to Billy Holiday, also from the Rattle and Hum album. All I want is U2 for Xmas.